'A really well-presented work that would be of great interest to a wide range of scholars. It makes several important suggestions regarding the nature of colonial scientific practices that substantially adds to our understanding of them. I would recommend it to anyone interested in imperial history, history of science/medicine and the growing field of animal humanities.' Saurabh Mishra, University of Sheffield, Journal of the History of Medicine and Allied Sciences 'Venomous Encounters is an exquisite attempt to illuminate the hitherto overlooked features of 'toxic histories' by foregrounding the presence of venomous snakes in colonial Australia and their potency in shaping the meanings and boundaries of 'scientific medicine' from 1788 to 1914. 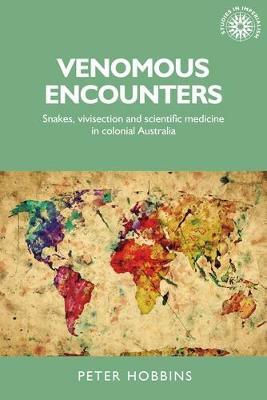 Written clearly, Hobbins's book explores the fascinating story of colonial encounters and vivisectional experimentations with animals and their toxins, specifically through the scientific characterisation of snakes and the nature, composition and action of their venoms. In doing so, it quite compellingly demonstrates the ubiquity of non-humans in the antipodean toxicological research culture.' Rahul Bhaumik, Jadavpur University, Social History of Medicine, Vol 31, Issue 3, August 2018 'In six meticulously crafted chapters, Peter Hobbins provides an insightful and vibrant history of an animal that featured prominently in the imperial "ecology of dread" (p. 3), offering a local, national, and transnational history of scientific and lay efforts to prevent the effects of snake venom through vivisection.' Lloyd Price, Cardiff University, Environmental History, Vol. 23, No. 4, October 2018 -- .